When you were younger did you ever read those Choose Your Own Adventure books? On each page you were faced with a choice that would ultimately decide the fate of the character. You’d excitedly turn the pages to see where your decisions had led. I feel like travelling as an almost adult (nearly 25 still waiting for the actual adult part to happen bear with me) is a bit like that. For better or worse you have the power to craft your dream trip. As such recently I made one of those almost adult choices. I chose not to backpack throughout Australia, but to instead book a series of shorter trips. What can I say? I’ve accumulated A LOT of clothes since I left the UK in 2016. A backpack just wasn’t going to cut it. I also have a job, which it turns out you have to regularly show up for or you don’t get paid. Funny that. And an apartment where I am forced to pay this monthly fee the real adults call rent. Baring this in mind I wanted to see the best the east coast of Australia had to offer. Over the course of my two week trip I scuba dived in the Great Barrier Reef, camped under the stars on the world’s largest sand island and found myself settling into the laid back ways of Byron Bay. The trip was jam-packed with adventures and memories to last a life time. It was the ultimate Australia bucket list trip. Today though I’m going to talk to you about one place, or set of places, in particular. The Whitsundays Islands. Are you planning an Australia trip and want to make sure you hit all the hottest spots? On a time/budget crunch and deciding which places are actually worth visiting? Or maybe like me, you just enjoy stalking people’s blogs and living vicariously through them. Whatever type of adventurer you are – allow me to lead the way by sharing my top 4 reasons why you should visit the Whitsundays Islands. The Whitsunday Islands are a group of over 70 picturesque islands based on the tropical coast in the Australian state of Queensland. Every day boats leave from the neighbouring town of Airlie Beach ferrying locals and tourists alike to their very own slice of island paradise. In true Choose Your Own Adventure fashion the type of boat you take depends entirely on your budget and interests. Do you love to party and drink terrible Australian wine out of a bag? Like to work on your tan while relaxing on deck? 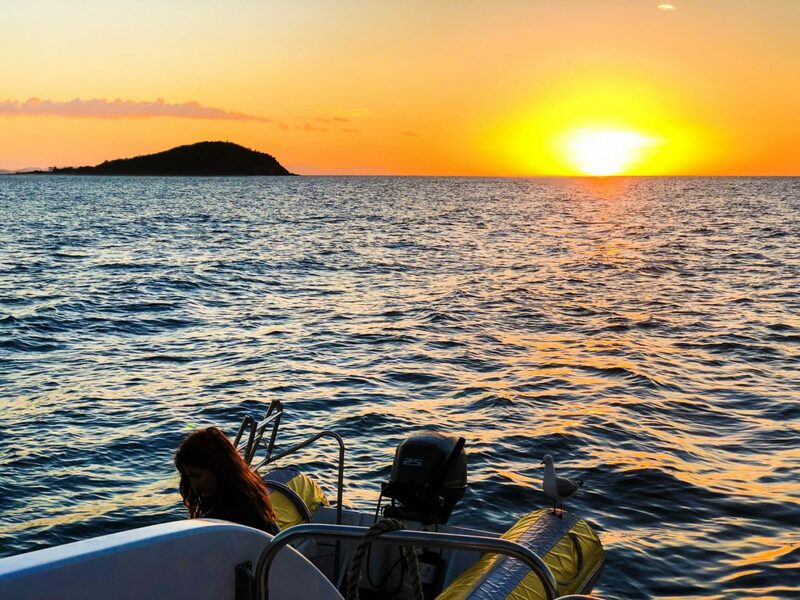 Or if you want to do something really special you can even charter your own boat! Something worth mentioning is you do get what you pay for. I chose to visit the Whitsunday s with a company called Wings and I can’t fault the experience. I’d say in terms of price it was middle of the range. It definitely wasn’t a party boat, but we did enjoy a few cold cans at night while watching the sun disappear into the distance. Bare in mind you when you visit the Whitsundays you are also sleeping on a relatively small boat. Ours slept 30 at an absolute maximum. Remember cheaper means less space and more people. 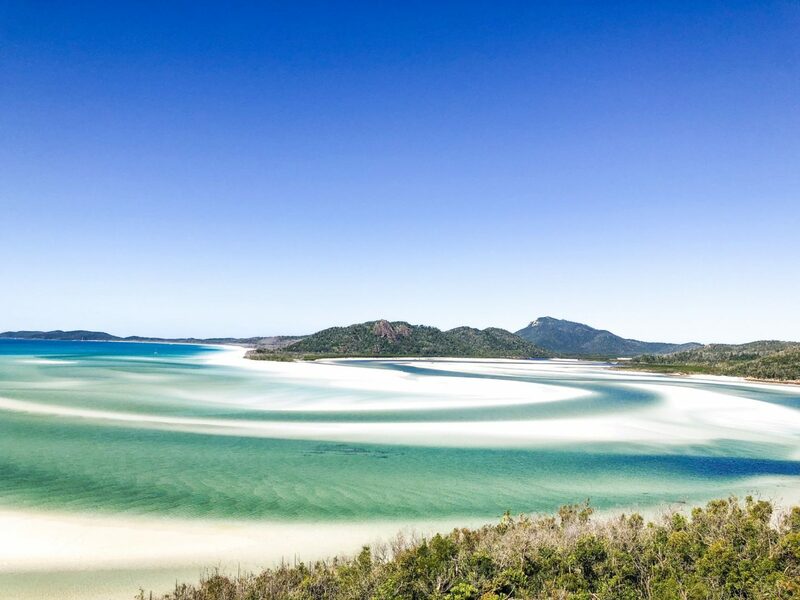 Whitehaven beach consistently earns a top spot on lists of the world’s best beaches and has won multiple awards. Setting foot on the 7km of land you can see why. Crystal blue waters and cool white powdery sand that glides between your toes. You think it can’t get much better. But it does. From above you can take a short walk to one of the islands viewpoints and look down at the blue and white swirling together to create a myriad of colours. It truly is like something out of a dream. It’s something you can only catch a glimpse of through pictures and words. I still can’t believe I was lucky enough to experience that moment in real life. When you visit the Whitsundays no trip is complete without a stop off at Whithaven beach. Not only is beach beautiful to look at, featuring the whitest sand I’ve ever seen, but it’s a real sensory experience too. The sand at Whitehaven Beach is 99% pure silica making it the purest in the world. Even visiting the beach on one of the hottest days the sand is cool to the touch. 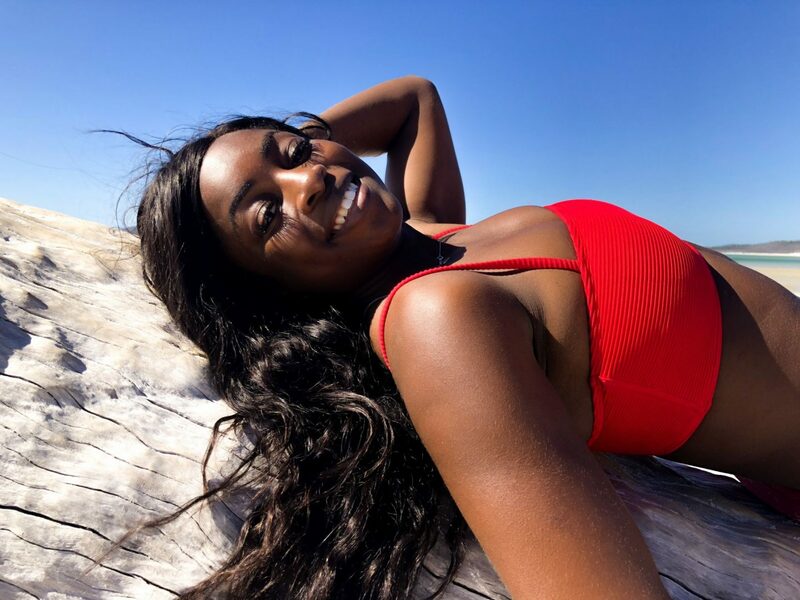 The sand is so pure you can use it to polish jewellery and exfoliate your body too. Only be careful getting that stuff in your mouth as it can wear away the enamel on your teeth. I feel like I’m still crunching even today. After the great Phi Phi Birthday Incident of 2016, I was a bit wary about snorkeling again. Picture the scene. It was my first week of travelling. I’d made some new friends. It was all fun and games fire limbos and dancing on the beach. We spent the night getting hammered on cheap Thai alcohol. The next day I went on a boat trip. I subsequently spent the day, my actual birthday, vomiting said alcohol out of my snorkel, into the ocean. To make matters worse I’d lost a contact lens in amongst the chaos. It was traumatic for all involved. When you’re in these once in a lifetime kind of places though you just have to do everything. So pink pool noodle and snorkel in tow I set off with a group from the boat to explore what lies beneath. I like to count this as my first time actually snorkeling. In my brain memories folder, I’m trying to reprogram things. Underwater I saw coral, big fish, little fish. Oh yeah, and I got slapped by a fish too. I honestly felt like I was in a scene out of Finding Nemo – it was magical. Unfortunately, I don’t have any photos so you’re just going to have to take my word for it. After three days visiting the Whitsundays heading back to the mainland was like being gently awoken out of a blissful stupor. Still – I don’t think it’s a dream I’ll be forgetting any time soon. What about you guys? 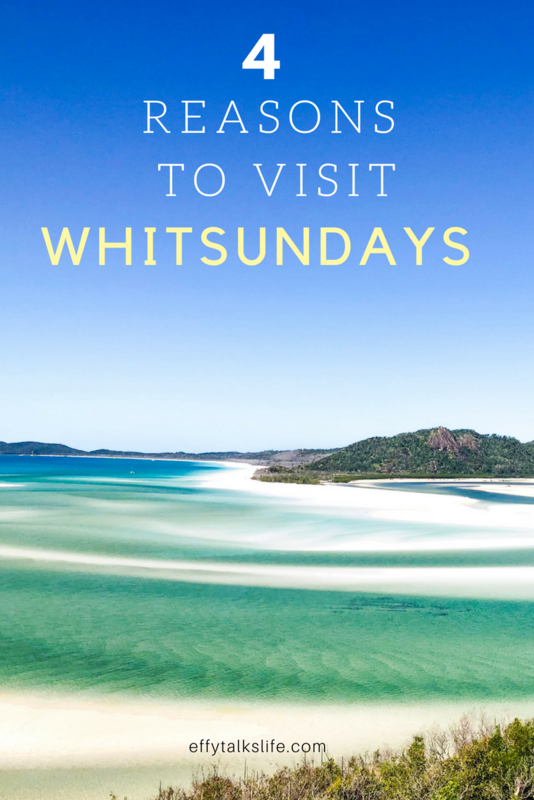 Do you plan to visit the Whitsundays? What places are on your Australia bucket list? Let me know in the comments! Next Post Australian Working Holiday Visa – Everything You Need To Know!